Generations of people in the United States have seen higher education as the best path towards a well-paying and satisfying job. But the cost of attending colleges and universities in the country has increased greatly over the last 30 years. And there is no guarantee that earning a degree will lead to a job that pays a person enough to support a family. So some people turn to other forms of education and training. These include programs that lead to certifications and other documentation that prove a person's abilities in a given field, from construction to healthcare. 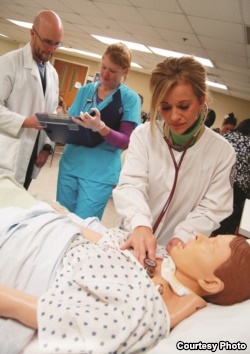 These kinds of programs often cost less than traditional degree programs. And they usually take less time to complete. Employers may still choose traditional degree-holders for top positions. But there are still many well-paying jobs that require a specialized kind of knowledge that certification programs provide. New research, however, suggests that these programs are not helping women as much as they are helping men. In 2016, the U.S. Department of Education began collecting data on work-experience and non-degree credential programs. The department released the final results of its research earlier this year. It found that about 27 percent of adults in the country hold at least one of these credentials. Adults who had one of these non-degree credentials made more money and were more likely to be employed than those who did not. Yet the public policy research group New America found some troubling information within that data. Experts there found that men and women earn these credentials at about the same rate. But men who have the same credentials as women are more likely to be employed. They also make more money. For example, 74 percent of men with a certificate but no four-year college degree were employed. By comparison, 67 percent of women with a certificate but no four-year degree were employed. In terms of pay, 46 percent of women with a credential but no four-year degree made less than $30,000 a year. The same was true for 25 percent of men, New America found. Seventeen percent of men with only a non-degree credential earned more than $75,000. Just five percent of women with similar credentials earned that much. New America released its report in September. Lul Tesfai is a leading policy expert at New America's Center on Education and Skills, and she helped write the group's report. She argues that these differences in employment levels and pay are due, in part, to existing gender divisions in some industries. The report found that some industries are either male- or female- dominated, meaning 70 percent or more of the workers are of one gender. For example, engineering and computer security are male-dominated fields. Office support jobs are female-dominated. The report also found that non-degree credential holders in male-dominated fields earn more money. Tesfai suggests that women are more likely to enter fields that are lower paying because of cultural influences. She says young men are often pushed into careers that value independence, leadership skills or even physical strength. She says society tells young women they are responsible for supporting others instead of working towards their own goals. Tesfai told VOA, "It's no coincidence that some of the female-dominated occupations are care occupations like healthcare and education." Karen Dove is the executive director of Apprenticeship and Nontraditional Employment for Women. Her nonprofit organization trains and supports women entering construction, repair and other building trades. Dove says that in some of the better-paying, male-dominated industries, women face a workplace culture that is not very welcoming. She says that on many construction sites, for example, male workers share a tradition of offensive humor and sometimes disrespectful behavior. Sexual harassment is common. And in several cases, male workers have sexually assaulted the female workers. "These are things that are still happening on these construction sites," said Dove. "Even if women enter the construction industry, they're more likely to drop out because of this type of culture that exists." 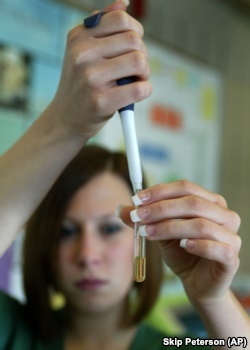 Brielle Hicks prepares to test the biodiesel fuel in a laboratory at Sinclair Community College in Dayton, Ohio. Ben Williams is chief executive officer of the National Alliance for Partnerships in Equity. The organization supports equality in education and employment. He says New America's findings present serious problems. Experts and educators often push these non-degree programs as alternatives to college, he explains. He says that experts may tell women that credential programs offer them a chance to pay less and possibly earn more in the future. But, if women in general are not getting the same results as men, they need to be told that, too, Williams says. Otherwise they may not be making the best or most informed decisions for their financial future by choosing these programs. "A lot of these jobs that we're talking about lead to family-sustaining wages," Williams said "And so if women are not accessing those occupations that lead to family-sustaining wages, it not only affects them…It affects their family." Williams and Tesfai agree that the first step to making sure the outcomes of these credential programs are more equal is messaging. Educators need to send messages to women and girls that any occupation is open to them, not just ones where they serve the needs of others. Dove says the efforts cannot stop there. Both she and Williams note that employers must also do their part. Williams argues that businesses must take note of how they may unfairly consider the abilities of men and women when filling positions. Dove adds that if offensive behavior is taking place on a job site, employers need to break with tradition and remove those involved. I'm Pete Musto. And I'm Dorothy Gundy. Pete Musto reported this story for VOA Learning English. Ashley Thompson was the editor. We want to hear from you. What kinds of non-degree credential programs are available in your country? Do they help all people equally? Write to us in the Comments Section or on our Facebook page.